Chicago Children's Theatre has done it again! They've managed to meld the unique vision of award winning author, Christopher Paul Curtis, with the phenomenal talents of a host of Chicago's finest, for a whole that's greater than the sum of it's parts. 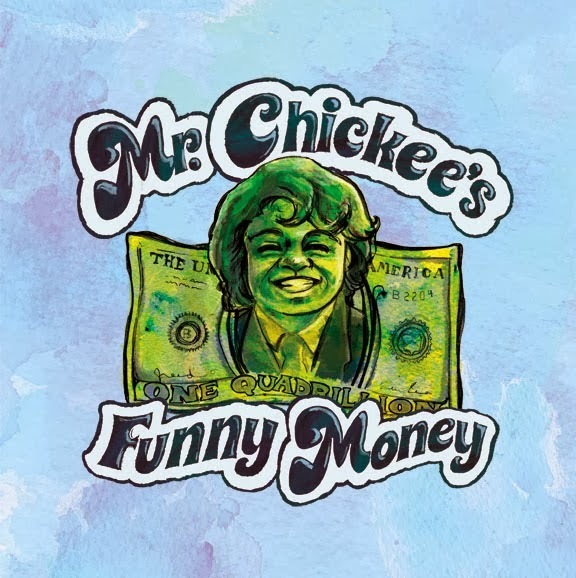 This production of Mr. Chickee's Funny Money crackles with fabulous R & B music, smart kids, a giant dog, a suspenseful plot, and an awesome message. Why does everybody want the funny money with the James Brown face?! Come see for yourselves! Highly recommended!! This madcap adventure has all the elements of a great show including stellar original tunes, a smart girl, kid detectives, bumbling agents, and a wise old blind man who opens the eyes of others, so they can see what's truly valuable. 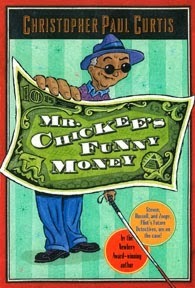 Mr. Chickee's funny money is thought provoking, fun and entirely impressive. We love that a father/son team collaborated on the score! The original songs are by Motown legend, Lamont Dozier, and additional music and lyrics by his son, Paris. They're done justice on stage by a dynamic 4 piece LIVE band and include a rockin' mix of Motown, disco, rap, rock, jazz and hip hop! Click the image above to watch the video trailer for Mr. Chickee's Funny Money! and that Ada Grey says will "make you feel nice! Like sugar and spice! Aoow!" Follow us on Facebook and Twitter for a behind the scenes look of our world premiere R&B musical. Add your voice to the experience all over social media and share the love using hashtag #MrChickee. Mr. Chickee's Funny Money runs through March 2 at the Ruth Page Center for the Arts. Get your tickets now! My 12 year old son and the adults in our family thoroughly enjoyed it, as did the rest of the audience, if the rousing standing standing ovation is any indication. This production has hit written all over it, with multigenerational appeal, and catchy tunes you'll be humming for weeks! What would you do if you suddenly found yourself with more money than you could comprehend or ever spend? Would it make you generous, greedy, or suspicious? Would it make your life easier and remove the stresses of car and house payments and working hard every day just to make ends meet, or would it make you a target and destroy the friendships you treasure most? Maybe all of the above. Click here to check out our prior Mr. Chickee coverage including all the show details & ticket links. We had the great pleasure of catching opening night, complete with pre-party, post show dinner and champaign toast, and truly stellar company! We enjoyed talking with CCT board members at length, chatted with infamous playwright Brett Neveu and his family, and saw Black Ensemble Theatre representing. We also ran into our friend Ada Grey (9 year old critic) and all around creative kid. It was a uniquely memorable evening. The food from Q and Wish Upon a Starch was fantastic. My kids have been immersed in the Chicago theatre scene their entire lives. Now at 10 & 12 they're still able to enjoy our city's stellar children's theatre offerings, but they've also become my go to +1's for big budget Broadway in Chicago spectacles, edgy storefront fare, and thought provoking dramas at Goodman, Steppenwolf and beyond. My 12 year old, son, in particular has become quite the insightful critic, and we both love a good post show talk. I was almost in tears on opening night of The Whale at Victory Gardens, as my son and I waited for the show to begin. Instead of grousing about attending a play or burying his nose in a DS game as many boys would, he was busy perusing the program. Then he turned to me and said "I'd really like to meet Chelsea Warren." When I asked why he said, "Because the show hasn't even started yet, but the set design is so cool it really makes me curious to see who lives here. It's really well done." Joy! Though they've been my silent partners for years, they've recently been inspired by Ada Grey to speak up and take an active role in our reviews for ChiIL Mama. I'll still be writing reviews, too, but they will have their own space for their own unique voices too. So check back with ChiIL Mama like we vote in Chi, IL... early and often. Sage & Du's Reviews (a kids' eye view) will be up very soon! ChiIL Mama's photo recap of the opening night after party with the cast and creative team (including Lamont Dozier and Christopher Paul Curtis) and the Chicago Children's Theatre family. 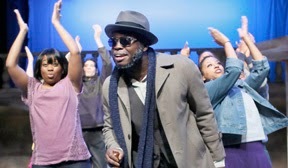 The opening night of MR. CHICKEE'S FUNNY MONEY on January 24 was the place to be as the audience was able to meet the all-star creative team (including Motown legend Lamont Dozier and Newbery Award winning author Christopher Paul Curtis), the cast, and the Chicago Children's Theatre family. Check out the pictures from our reception featuring the cast and creative team (including Lamont Dozier and Christopher Paul Curtis) and the Chicago Children's Theatre family. Feel free to tag yourself in the pictures and share with your family and friends! Chicago has fallen in love with Mr. Chickee and so will you! ChiIL Mama's been eagerly awaiting this production since we bought the awesome book last year at Chicago Children's Theatre's Bud Not Buddy (based on another Curtis kids' classic) and got it signed by the author himself. It was well worth the wait.